Wordpress is the most popular Content Management System and widely used by bloggers and offers a lot for other kind of projects, for instance community and eCommerce projects, too. 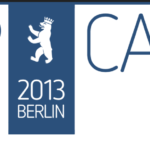 WP Camp is the ultimate WordPress Event in Berlin and is supported by Fashion Insider, since it was founded in 2012. Again, in 2013 Fashion Insider is supporting the event in order to strenghten the WordPress community and ecosystem in Berlin. Please find out more about WP Camp here.